A fiercely passionate Romeo and Juliet is playing at Zombie Joe’s Underground in North Hollywood. Smartly directed by Denise Devin in an adaptation that compresses the well-known story into a succinct 65 minutes, the highly physical and athletic production sallies forward in pursuit of a multitude of burning desires; rage, lust, obsession, and revenge among them. And it does so at breakneck speed. 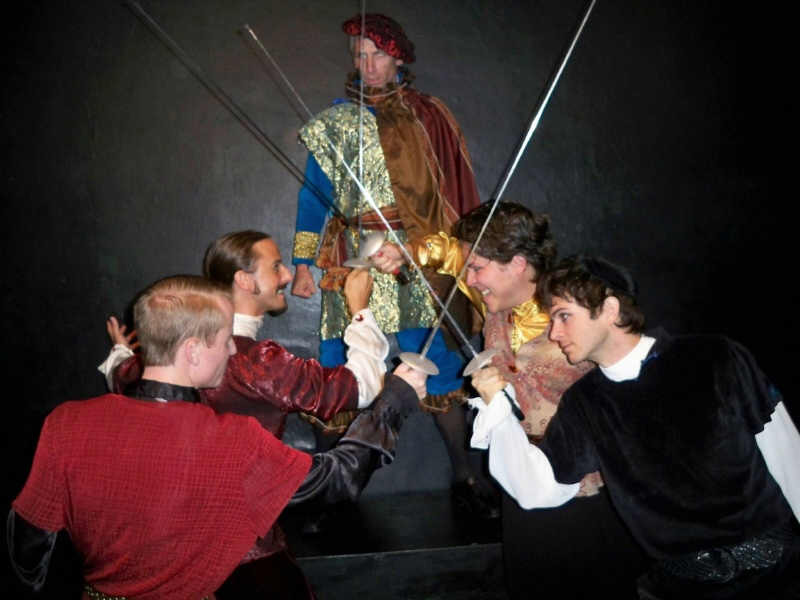 You can feel the heat from the moment the four testosterone-driven young lads of the houses of Capulet and Montague clash swords in an explosion of color, sound and motion. One almost fears that the hotheaded Mercutio (a terrific Rafael Goldstein) will all but explode if his pent-up rage cannot somehow find quick relief, but this rendering of Romeo and Juliet is not about relief. At its core it is much more intense. Even the young lovers (Alexis Justman and Robert Walters) are driven by a wild, untamable attraction, their bodies ready to swallow each other whole in what few moments they are able to steal – on the infamous balcony, in the woods, or otherwise. And later, Lord Capulet’s (John Moskal) impassioned chastisement of Juliet and Lady Capulet’s (Georgan George) woeful screams further press the in-your-face quality of Devin’s directorial vision. But, lest you think all is serious in Zombie Joe’s pulsating Verona, humor, too, springs from the well of this Shakespearean tragedy. With nary a pause to slow the action, characters cross quickly in and out of scenes – the ever-skeptical flitting Nurse played by Peter Brook Morrison, a prancing Paris (Wallace Bruce), and the sweet-faced Benvolio (Curtiss Johns), who pokes and prods to lighten the taut grip of indignation on his peers. As death claims its many victims in this oft told tale, I couldn’t help but be incredibly moved by the sad irony of it all. The doomed lovers tragically pay the ultimate price for their fathers’ feud. More than once bodies littered the floor, and Mercutio’s earlier death is several of the most gut-wrenching minutes of the play, heightened by the close proximity of actor to audience. Gorgeous costumes by Jeri Batzdorff pop in brilliant contrast to the intimate black box that frames the action, and the swordplay is fast and furious, well-choreographed – though uncredited – and done to perfection. The cast even squeezes a lovely bit of dancing into the compact evening. My introduction to Zombie Joe’s complete, I can only say I am now looking forward to seeing what they will do with their upcoming late night production of The Tempest.